Ok, buying hardware toys I mean tools is nice, but that extra chunk of work had completely exhausted me in recent days. Have to admit I am unable to write more of anything remotely useful this week. So this evening I took my mind of rat race to improve and automate my computing. 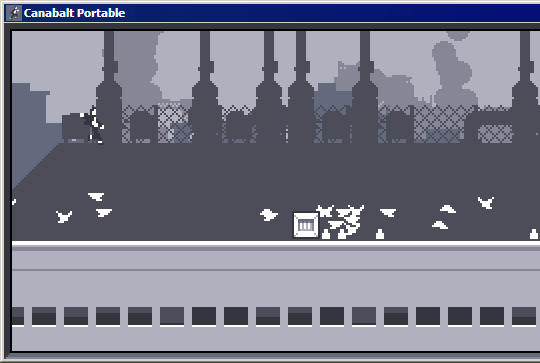 And wasted time playing Canabalt – simple, cool, free and browser/portable action game. Your run and jump. More accurately game does a running for you and you have to take care of jumping. That is unless you want to meet a wall and no longer run (also known as game over). Actually jumping is the only thing you can do so game controls amount to single key. giant robots in background (you supposedly run from). There is no sense of loss in game – fail smoothly merges into restart and you can just stay in loop endlessly. Track always has same start but rest is made of randomized elements so you can’t learn or predict how it goes. Despite appeal of minimalism game feels like too little of actual game. It could benefit from some additional gameplay options when you reach fast running speed… and from there you are probably going to get crashed by randomized impassable spot sooner or later (sooner). This one is unlikely to rack up major gameplay time. On other hand game provides surprisingly relaxing and almost meditative experience, that very few action games get right. I like this type of posts, where it is not the normal things you talk of. I also like it because it is about something new. I saw that game on PortableApps.com, but did not try it because I thought: “bah, just another game”. But after reading your post here, I downloaded it and… dang, what a game! I just lost half an hour playing this game. I like games. Silly games. Mindless games. Once upon a time, I loved the puzzle games that took a lot of thinking. No more. Now all I’m interested in is rest for the galloping, if not very clever, brain that I am stuck with. Games are supposed to be relaxing, fun, not another stressor. Thanks for pointing this one out. And have a relaxing day! I didn’t check it right away either, but screenshot was interesting enough to download and store in stuff to sort through. I like puzzles but there are very few interesting and original around. Match-3 stuff is interesting first few times, but not when most of games are its variation. LOL, this game accounts for a great deal of my wasted time over the past few months. No sooner had I stopped playing it on my Mac I found the iPhone game and have been hooked!